Every now and then you may come across some problems with pineapples in a shipment. Common defects are bruising and decay, which are easily identified. 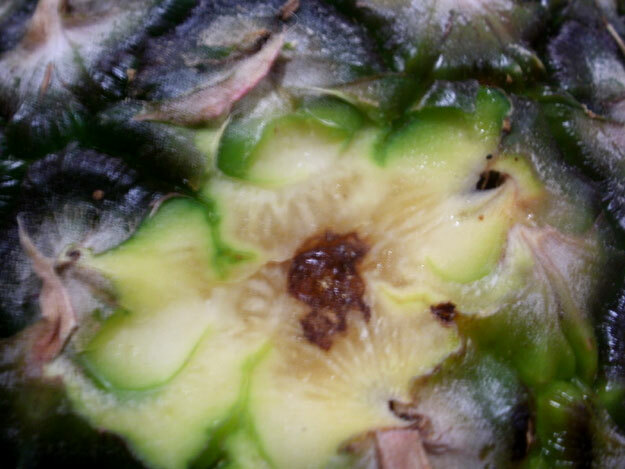 Recently an inspector came across some pineapples that were showing a brown discoloration around the eyes. It was correctly identified as gummosis. He shared with me the following images. As shown above, this defect can be found on the surface of pineapple, appearing as a brown to dark brown discolored spot. The USDA Inspection Instructions state a definitive scoring definition. Let’s take it one step at a time. Based on the USDA, if the discolored spot(s) affect an aggregate area greater than 1/2 inch in diameter, it should be scored as damage. Based on the scoring guideline, the discolored spot seen above does not appear to be larger than 1/2 inch in diameter, thus it would not be a defect. But the USDA goes on to state, if the gum deposits slightly penetrate into the flesh, then regardless of the area, it is scored as damage (and as serious damage), a defect of the U.S. No.1 Grade. As you can see, after cutting, the gummy deposits do penetrate the flesh. Remember, if the affected area alone is not exceeding 1/2 inch, you must cut into the pineapple to determine if the flesh is affected. This pineapple is now scored as a defect. In this case the defect is scored as serious damage. Anytime the flesh is affected by a gummosis, it is scored as serious damage. Your next question may be how many pineapples can be affected by gummosis, and still meet the U.S. No. 1 Grade. The USDA classifies gummosis as a quality defect. 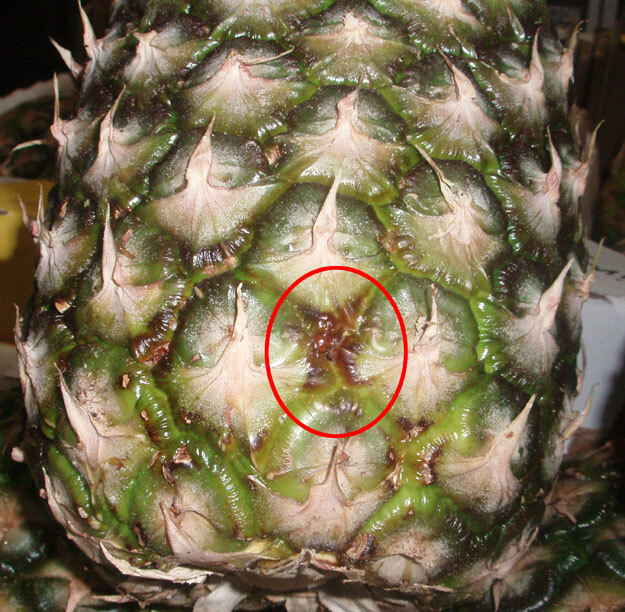 Insects, while the pineapples are growing, are the primary cause of this defect. The discolored area will not become larger, or darker in color. The affected area may be more susceptible to decay, but the gummosis itself will not become worse. The tolerances for pineapples allow for up to 8% quality defects, including 4% serious damage by quality defects. In other words, if the affected discolored area of gummosis exceeded 1/2 inch, and the flesh was not affected, you would be allowed 8% of the pineapples to have this defect. But if upon cutting, you found more than 4% of the pineapples with the flesh affected by gummosis then you would be out of grade. It would have been nice, if they would have cut the pineapple in a crosscut in the Gummosis external area, so that we could have seen the impact from the outside skin to the internal condition.